You might question how being “present in the moment” is a positive thing – when you’re stuck, feeling sad, stressed, anxious or depressed. But stop, the emotions you are feeling are actually unlikely to be related to the present moment but to a past or future event. Mindfulness connects you to the current moment, a time you can influence now. Think of the stress reaction – muscles tighten, stomach churns, become sweaty, breathing difficulties, fight or flight adrenaline/cortisol hormones kick in. Our thoughts go back to a similar experience and the negative beliefs that we created from that experience and the emotions this brings up, triggering stress. However, these hormones aren’t burnt up (from running away) and so remain in the body keeping us on “high alert” creating issues of anxiety, panic attacks, sleep problems, headaches and restlessness. The alternative mindful response is to move out of the flight/flight response and into a “being” response – to slowdown, notice breath, feel grounded, acknowledge the thoughts (don’t judge them). Preventing the release of more stress hormones, allowing the release of the calming hormone oxytocin instead. What is mindfulness – it’s about “being in the present moment”, watching your thoughts without engaging and judging them. It’s about quietening the mind and when thoughts come up replying with a “ah that’s interesting” and then letting them go, not creating an inner dialogue/emotion about the thought. The benefits of mindfulness are to allow you to relax. Mindfulness is shown to reduce stress, tension, anxiety and depression, reduce anger outbursts and generally be a positive tool in your daily life. Who can Mindful Meditation classes benefit? Anyone who is looking to reduce their stress levels, support better sleep, feel calmer & more in control of their emotions, anyone who is looking to relieve their symptoms of anxiety or depression, or simply anyone who is looking for an hour to “be” themselves & relax and renew themselves. Mindfulness and meditation go together perfectly, bringing great relaxation to mind and body. Mindful Meditation for Relaxation classes run at the Tina Carter Wellness Studio are suitable for everyone. Led by Romella Jones. This is a short video explaining how I advise people to cut cords from people, past events and experiences. Do you find yourself drained when around certain people and then exhausted when you get home or the next day? Do you feel out of balance some days and just can’t put your finger on it? Have you had a breakup but still feeling drained and attached to them? Do you work with people who exhaust you but don’t know why you feel this way? Want to change this, then watch this video and read on afterwards…. Its not about needing to eat to get some energy to do “stuff”, this is more spiritual yet very physical, This is about your energy being zapped by other people, whether those you know, work with or when out shopping or in busy environments. Think of how you feel when you go to a busy shopping centre, as functional as the shop might be, often you can feel quite drained and dysfunctional when you leave. All living things are made of energy and affected by the energy of those around them (intentionally or not). This session will help you become aware of your energy and be able to take positive action to protect and support yourself. From all my experience and qualifications, I have a brought together a one-hour session part training and part therapy, allowing you to learn techniques to protect, support and nurture your energy whenever you need it. This Energy session looks at your cutting cords that no longer serve your highest good, leaving those of love, clearing your aura with Aura-soma pomanders, creating a protective bubble so only those of love come through to you, checking and balancing your energy through crystals and finally hands-on energy healing to seal the changes into your physical body and aura. You will learn how to protect yourself with bubbles, how to ground yourself into the now, cut negative cords, and a mini-introduction to self-healing. This session is designed as a one-off (as you learn the techniques to use yourself) but can be used a a re-boost or re-set whenever needed. The session will last an hour and costs £45, it includes a small bag of chakra crystals and “memory” sheet of tips. Background – I have been a Reiki Master-Teacher for over 15 years and am qualified and insured in a wide range of complementary therapies from massage to energy practitioner to crystals to Aura-Soma. All have come to me to help me on my journey and for me to be the person I want to be – thus allowing me to enable you to be the person you want to be! Healers Gold – a crystal so yummy!! This blog is about the amazing crystal Healer’s Gold. It might seem strange to dive straight into this little known crystal, rather than clear quartz or rose quartz or citrine and build up to the more unusual. But chances are you’ve worked and played with those already, so something different! I discovered healer’s gold when a crystal guide opened on that page and I was instantly intrigued. 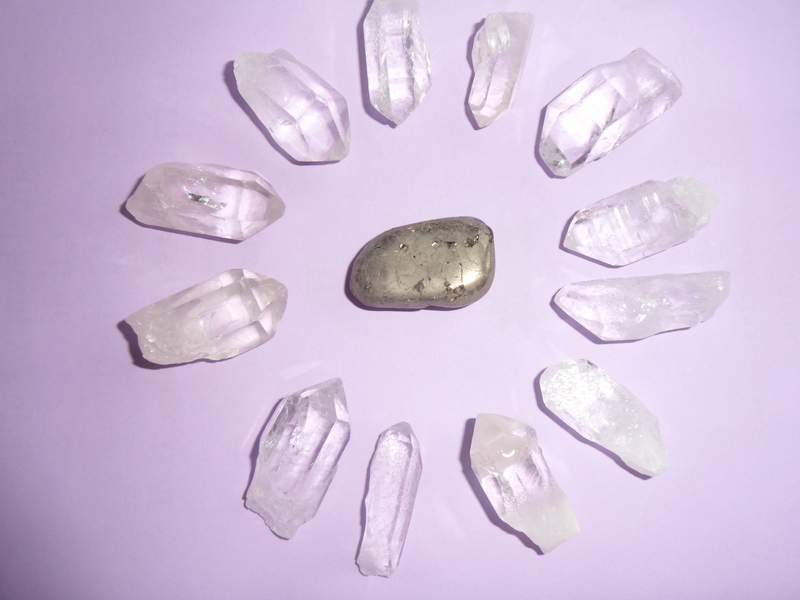 As a healer and crystal therapist I am always looking for ways to use crystals to benefit my intuition, protection and client healing release. You know that feeling when you see a crystal which you just know is going to be in tune with you – love at first sight! I use it for everything now! As you may not have heard of healer’s gold, let me give you some information. It is a compound of pyrite and magnetite, mined in Arizona. It’s colours are mixture of gold and black, beautifully shiny and with a lovely heavy weight to hold. It is a healing grounding crystal of high-frequency energy, bringing energetic balance and harmony. It balances the male and female aspects, aligns the astral, causal and subtle bodies, activates lazy chakras and thus energises. It brings about a synergy between practitioner and client in a treatment. I am an energy healer and use reiki in all forms of treatment that I do, so this earthy energy fits me snugly and I find it grounds and protects me, increases my intuition and helps the client to ground the healing being given. In my reflexology and massage it is always within the clients aura area and in reiki it is at the head, whilst for crystal therapy I tend to use it as the grounding stone. It works at all chakras, regardless of colours. When I channel information and do reiki attunements I find it soothing and smoothes the way for me to find the words and communicate true meaning that will be understood by the client. As a crystal junkie I think I have found my sole mate crystal! Grounding, protection, enhanced intuition, chakra balancing and energising all in one! Who could want more?! I’m off for a meditation with a piece now as a reward for all its hard work in this blog!!! I do have a small quantity of healer’s gold available to buy, so please contact me. 12 crystal points freshly cleansed and energised and ready for action with healers gold!